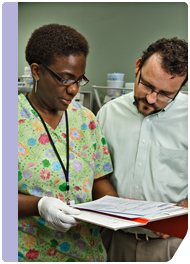 D-PATH recognizes that clear, concise and timely diagnostic reports are at the core of our service offering. Our dermatopathology staff is focused on delivering a high quality diagnosis in a customized report format. In addition, our laboratory is designed to deliver the fastest turnaround time in the nation. Reports are routinely delivered within 48 hours and only in the case of special stains or expert consultations are they delayed. Taking care of your patients. Taking care of your practice. This is a comprehensive database of all accessions from a given account in a given time period. Data can be sorted by a number of parameters including ICD-9 code, diagnosis, ordering physician and procedure date. This report monitors the turnaround time speed of patient results. This report can be provided to insurance plans as a key quality indicator and offers you a tool to evaluate and compare laboratory service levels.